Rosenthal, a New York Times senior writer and former physician, provocatively analyzes the U.S. healthcare system and finds that it's "rigged against you," delving into what's gone wrong as well as how Americans can make it right. In the first part of this astounding takedown, Rosenthal unveils with surgical precision the "dysfunctional medical market" that plays by rules that have little to do with patient-centered, evidence-based medical care. In part two she prescribes the rigorous but necessary steps to fix the broken system. 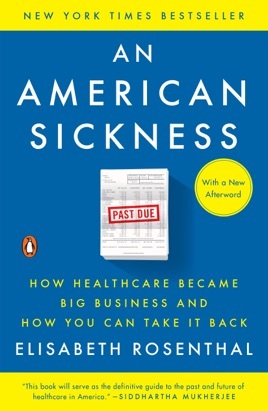 Rosenthal chronicles a startling cascade of escalating pressures that steadily drove up medical costs, including the skyrocketing spread of health insurance coverage in the 1940s and '50s, hospitals' adoption of big-business models, and doctors' convoluted payment schemes. "Our healthcare system today treats illness and wellness as just another object of commerce: revenue generation," Rosenthal writes. She also notes that politicians, insurers, hospitals, and doctors have all maneuvered to "undermine" the Affordable Care Act. Her advice for now is starkly simple: we need to question everything, including your choice of doctor, hospital, billing statement, insurance, and the drugs and devices we're prescribed. Given the "false choice of your money or your life," Rosenthal argues, "it's time for us all to take a stand for the latter." This book provides fantastic details about flaws in the American healthcare system. But more than that, it also offers solutions – both at a systemic level and for patients in the healthcare system. One of the neatest aspects of this book is the appendices, which provide a vast array of resources for healthcare consumers, including template letters to dispute overbilling.